Moving. The thought of it makes me shudder. I’ve often joked that it would be simpler to just set everything on fire and start over. But, you know, that’s expensive, and I’m kind of attached to some of my stuff. OK, a lot of my stuff. So, that’s just not an option. That sentiment comes from moving a lot, I think. Not as much as some, of course. Military families, for example, move all the time. But I had my fair share of location upheaval in my youth. I lived in six different towns and residences by the time I graduated high school. Two different states. Four different school systems. Again, not as much change as some, but enough to be a bit unsettling. As you can see, I have some experience with moving. And I can say with some authority that it’s hell. I can count on pretty much four to six months of lost productivity (except for the moving thing). Which is why I’m so amazed at the latest project Dean Wesley Smith has embarked on. Dean and his wife, Kris, are in the process of moving to Las Vegas. They’ll still have a home base here, but much of their time will be spent there, and they won’t need their rather large house here anymore. And so Dean is in the midst of dismantling said house to complete the move. And because he’s Dean, he decided to throw in a writing challenge for good measure. Thirty short stories in thirty days. Did I mention he’s moving??? Well, he’s on day nine already and going strong. 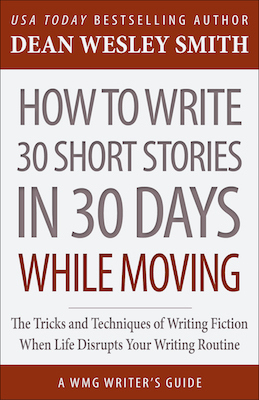 Oh, and he’s writing a nonfiction book while he’s at it called How to Write 30 Short Stories in 30 Days While Moving. If I’ve learned one thing in my six years running this business, it’s that when Dean sets his mind to something, it usually gets done. If you want to follow along from the start of this adventure, click here to go to Dean’s first blog post about it. He posts a new blog every day with an update.